What can I say? After promoting Tim Ball's wacky One World Guvmint conspiracy theories, now Anthony Watts has got Tim Ball resurrecting Velikovsky's Worlds in Collision. Scientists pointing out that the 1950's book was gobsmackingly stupid is another sign that climate science is a hoax. I wonder what the WUWT-ers will make of that? He gave them seven whole days. In his next request, he'll no doubt separate words white from house, united from nations, clean from power and plan, Council from quality, and maybe boy as well as buoy, etc. He might also widen temperature to temp, which would allow him to get any emails relating to temporary whatever. "there's been a change to my mobile phone number"
"can you change the staff meeting to 2:00 pm"
"Lamar Smith is spelt with an "i" not a "y". Change all versions of "Smyth" to "Smith""
"please ship the staplers to our Seattle office"
If he does, then he'll probably spend years trying to work out the coded messages in the above. Nobody makes them like the Republican Party in the USA. Nutty as a fruit cake. accept that a Pause is not the same as a stop! Well it doesn't contradict it. Needless to say Anthony and the Examiner was comparing apples and oranges. The new paper, Fyfe16, discussed the reality of the slowdown. 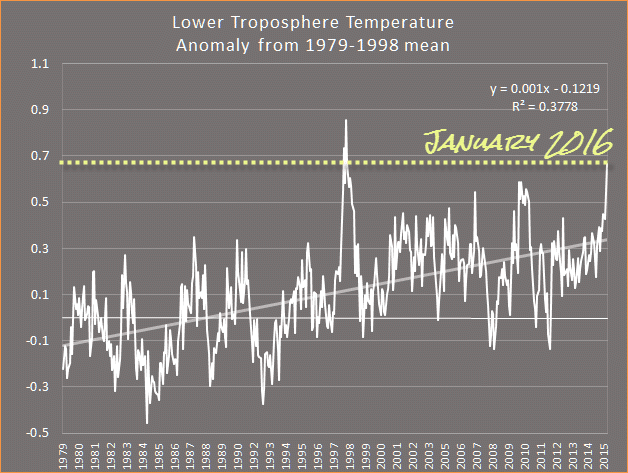 There was no "hiatus" or stopping of global warming, contrary to Anthony Watts' headline. The rise in global surface temperatures slowed down earlier this century compared to the rate of rise from the mid-1970s to the late 1990s. 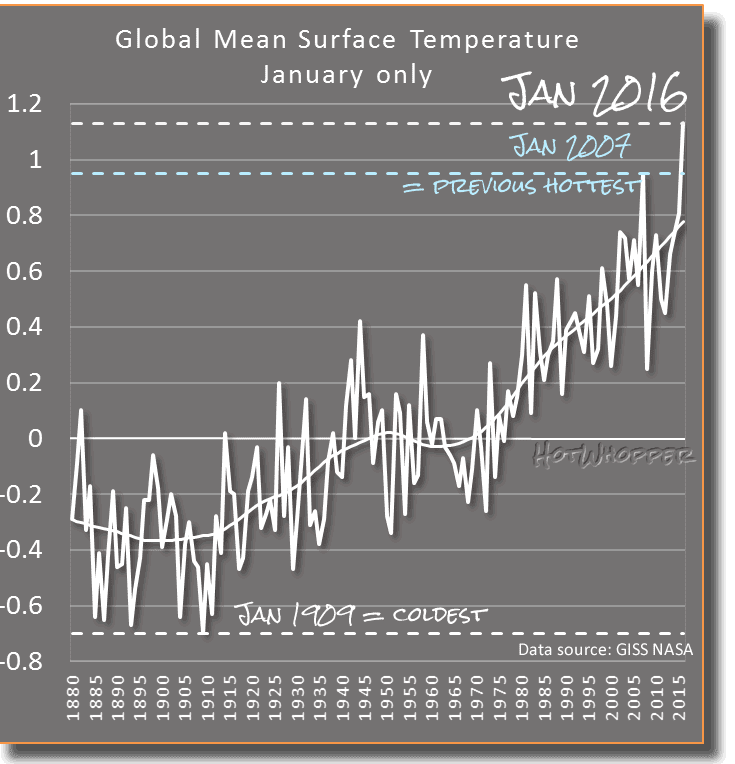 As Jeff Tollefson of Nature wrote about the lead author: "Fyfe uses the term “slowdown” rather than “hiatus” and stresses that it does not in any way undermine global-warming theory." We need our CSIRO climate scientists. Kevin Trenberth is one of the world's leading climate scientists and a top science communicator. He is one of the experts who is more than willing to explain the science of climate to the general public and is often approached by journalists. Jim Steele is a science denier and disinformer. I doubt he would ever be approached by mainstream scientific journalists. Jim uses climate conspiracy blogger Anthony Watts to promote his denial and his vanity-published denier manifesto. Kevin Trenberth has 700 papers listed in his Google Scholar listing, and an h-index to weep for (97). Jim Steele has zero peer-reviewed publications and probably doesn't know what an h-index is. and neck above the rest. Today Jim Steele has written a Gish gallop attacking Dr Kevin Trenberth (archived here). As you know, this is a favourite technique of science deniers. It doesn't work so well these days, since the technique was named the Serengeti Strategy (by Michael Mann in his book "The Hockey Stick and the Climate Wars"). The aim is to try to discredit an individual scientist, isolate them from all the other climate scientists, and then say "aha - climate science is a hoax". Yeah - it's pretty dumb, isn't it. Even were someone to find a mistake in a scientific paper, or object to something a scientist once said, it's hardly going to tear down the fabric of science. Most of the time, however, as in this case, it's the deniers who get it wrong, not the scientist they are attacking. 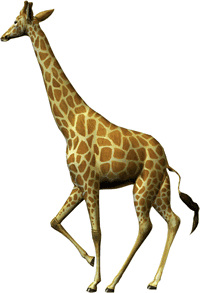 I thought about which Serengeti animal would typify Dr Trenberth and settled on the giraffe. It's got a great personality, it stands head, shoulders and neck above the rest of us mere mortals, it's elegant, and it would respond to attacks from dim deniers with the grace and wit befitting an honest person of strong character, like Dr Kevin Trenberth. TC Winston is only the eleventh Cat 5 storm in the southern hemisphere east of Australia since 1970. Winds of 165 mph or 266 kph have been reported. I don't know if these are wind guts or sustained wind speeds. 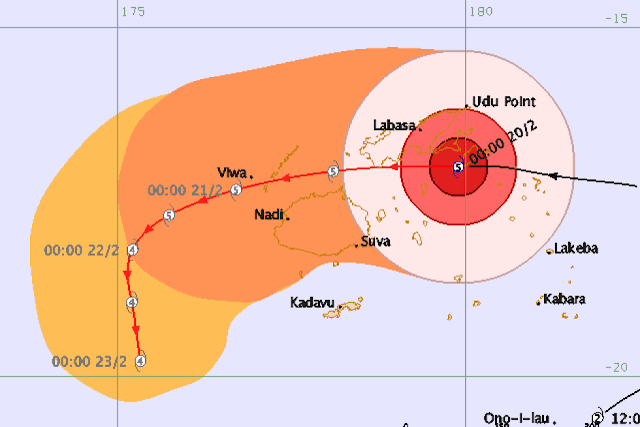 For comparison, Yasi was thought to have reached wind gusts of 285 km/h at landfall. Jeff Masters and Bob Henson reported that when it hit the airport at Vanua Balavu, 10 minute wind speeds were around 170 kph (106 mph), suggesting 193 kph (120 mph) one-minute wind speeds. 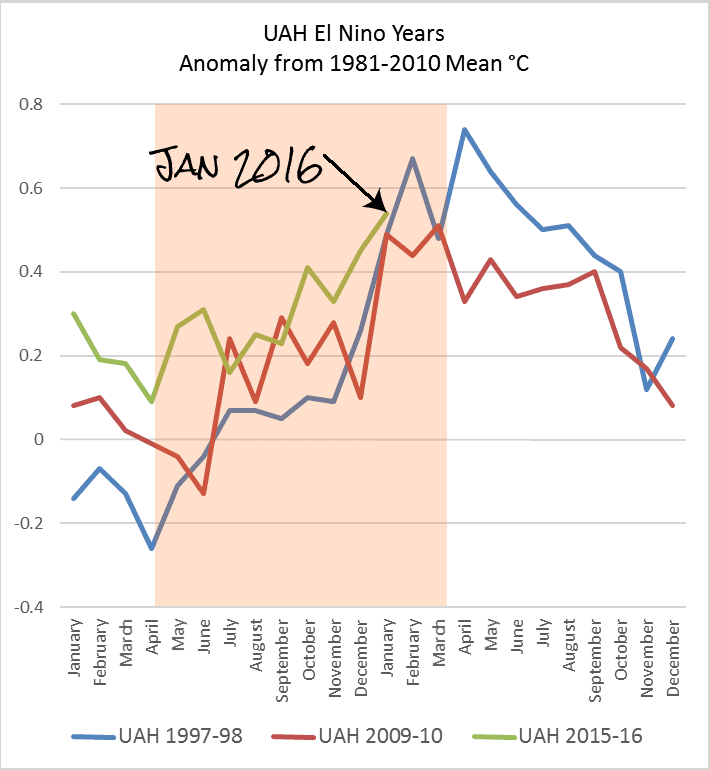 The current El Niño is still going and will continue for a while yet. Science deniers are hoping against hope there will be a La Niña later this year. 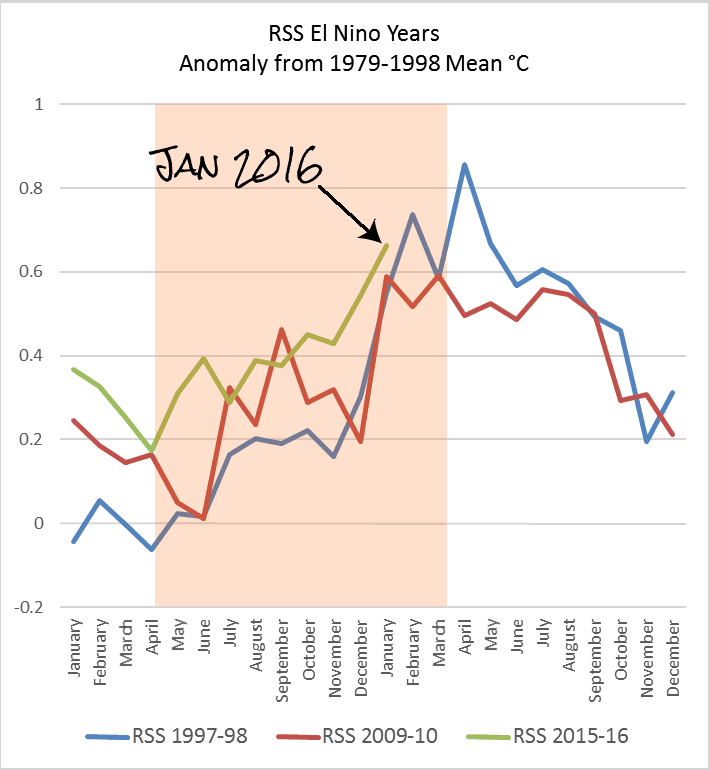 Anthony Watts has posted an article where he says that one source predicts a La Niña (archived here). I don't know why he wants one. He lives in California, which is suffering extreme drought. A La Niña could well exacerbate the drought. Anyway, you'd think they'd all be very glad of this current El Niño. It may allow them in a few years to start claiming that "it hasn't warmed since 2016". Based on the 26 El Niño events since 1900, around 50% have been followed by a neutral year, and 40% have been followed by La Niña. International climate models suggest neutral is most likely for the second half of the year. 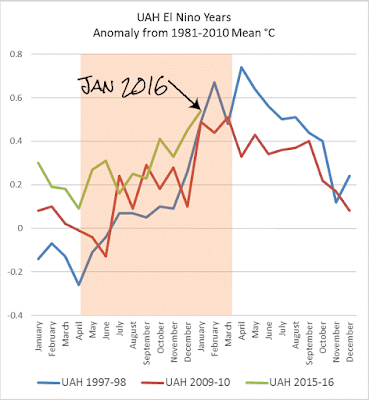 However, La Niña in 2016 cannot be ruled out, and a repeat El Niño appears unlikely. 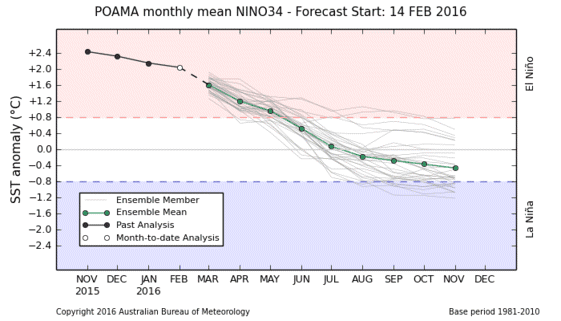 Below is the latest BoM chart of the model outlook through to the end of the year. The blue shaded area is La Niña territory. Anthony Watts is busy looking for squirrels in Arizona to distract from all the record high temperatures. He's found another poorly sited weather station (archived here). Without acknowledging that his previous find wasn't used in any dataset, national or global, he is delighted to find that this one is. It's located at the small town of Parker in north-western Arizona near the border of California. Parker 26250 is included in the GISTemp global data set up until 2007. It is also included in the NOAA USHCN dataset. There are quite a few quality problems with it, as shown at Berkeley Earth. There is missing data, it's very poorly sited, and it's had several replacements of an MMTS sensor. The issue is not that there are poorly sited weather stations in the data sets. The question is: are they biasing the record? The answer would be a resounding NO! They are not. Remember that video produced a few weeks ago from the usual suspects that says satellite data is no good for climate data? Others in science don’t seem to think so. First of all, the paper is about ecosystem sensitivity not climate sensitivity in the temperature sense. That is, how the different ecosystems around the world are responding to climate variability and change, not how much temperature will increase with a doubling of CO2. Secondly, the satellite-derived data is from the imaging spectroradiometer (MODIS), and shows vegetation changes. It's not from the Advanced Microwave Scanning Radiometer (AMSR-E) or other microwave scanning instrument, used to measure "brightness temperature" or the radiance of the microwave radiation of the atmosphere, from which air temperature in different layers of the air is estimated). Any time there's a chance to reject science, Anthony Watts will grab it with both hands. Today he's decided to build a strawman out of bees. He's found a rather shallow article at Washington Post, which looks to me to have a lot wrong with it. The article was about how beekeepers have managed to rebuild the honey bee population in the USA. It's not yet back to its heyday of 1990, however it's increased from the low days of 2006 by about 20%. Close to the end of the article, a couple of economists are quoted cheerily calling the recovery "a victory for the free market", oblivious to the government support that helped address all the huge problems. 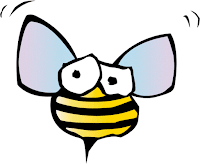 Anthony Watts wrote the headline: "Bee-pocaclypse called off, bees doing OK, global warming was never a cause" and referred to an old article from Wired. I say he referred to it, but he didn't link to it, he just copied and pasted a snapshot of the headline. That very short 2007 Wired article was about an article at Salon. That Salon article in turn was about how scientists were starting to look into the massive decline in the US population of honeybees. There were a lot of possible reasons put forward in the Salon article, but at the time (2007), all the research wasn't in. 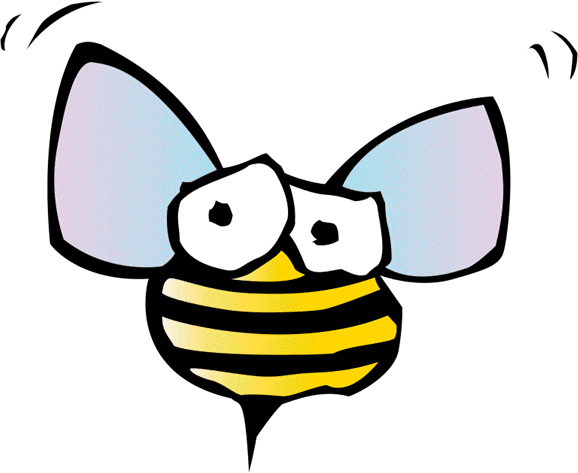 Needless to say, Anthony Watts didn't give any insight into US honey bees. He doesn't do background research. His forte is copying and pasting slabs of text pinched from somewhere or other, putting his "claim" dogwhistle headlines on top of scientific press releases, and promoting logical fallacies and wacky climate conspiracy theories. Anthony Watts is busy trying to divert attention from all the record hot temperatures. He has posted another article from Ari Halperin. He's the chap who created a Google search tool for deniers, which filters out science websites and only leaves in denier websites. And below are six denier talking points, with full on conspiracy ideation, that he posted instead. The alarmists first declared “scientific consensus” in 1988, and have been digging their heels in, persecuting skeptics, and constantly suppressing scientific inquiry since then, just as Richard Lindzen reported in 1992. They have been repeating their mantras and persecuting all other viewpoints. That point that he listed is very mixed up. Ari doesn't indicate what the consensus he's complaining about was. Nor does he cite any evidence, which might have given a clue. Is he referring to global warming? That was known way back when. Callendar made detailed calculations of how the increased CO2 would warm the planet way back in the 1930s. Gilbert Plass wrote an important paper after the war in the 1950s. Over subsequent decades there were more and more papers written on the subject. Why Ari has picked out 1988 as a year for a declaration of scientific consensus on who knows what, I don't know. Nor do I know who he thinks has been persecuted. 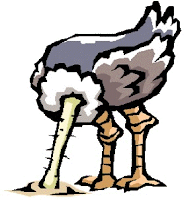 Is that denier-speak for refuted, rebutted or debunked? Anthony Watts was sent a bunch of photos from a fan of his, Mark Albright (archived here). If you've been hanging around climate blogs for a few years you might recognise the name. Mark is listed as Research Meteorologist at the University of Washington, and hangs out with Cliff Mass, who flips and flops between acting like a full-on climate science denier and accepting that humans are changing the climate. 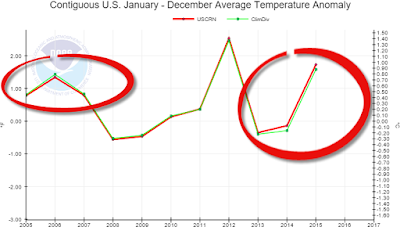 Mark Albright got himself into the climate spotlight a few years ago, when he did something foolish with snow data. Given his preference for WUWT, and his past antics, I'd say he's just another science denier from the USA. What Mark found was a poorly sited weather station in a park in Arizona: Picacho 8 SE. So he sent lots of photos to Anthony Watts. Anthony, in turn, for want of anything meaninful to write about, has filled his blog with the photos. 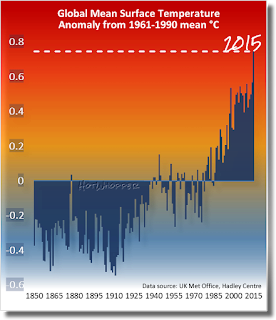 The previous highest monthly anomaly was December 2015 at 1.11 °C above the 1951-1980. 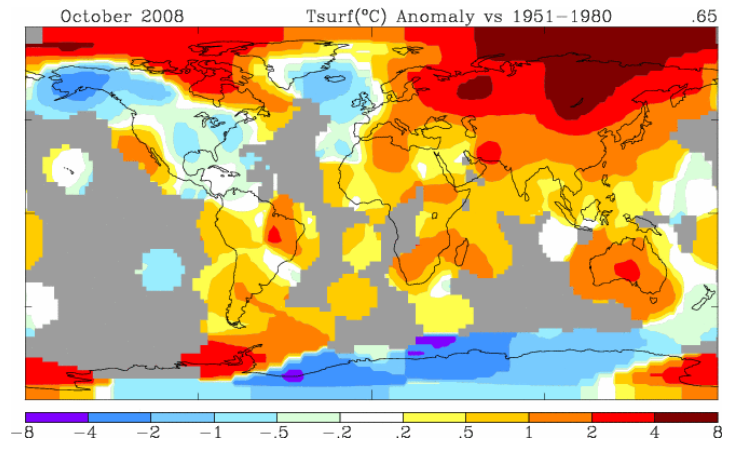 The previous hottest January was January 2007, at 0.95 °C above the 1951-1980 mean. The coldest January on record was in 1909, at 0.7 °C below the 1951-1980 mean. 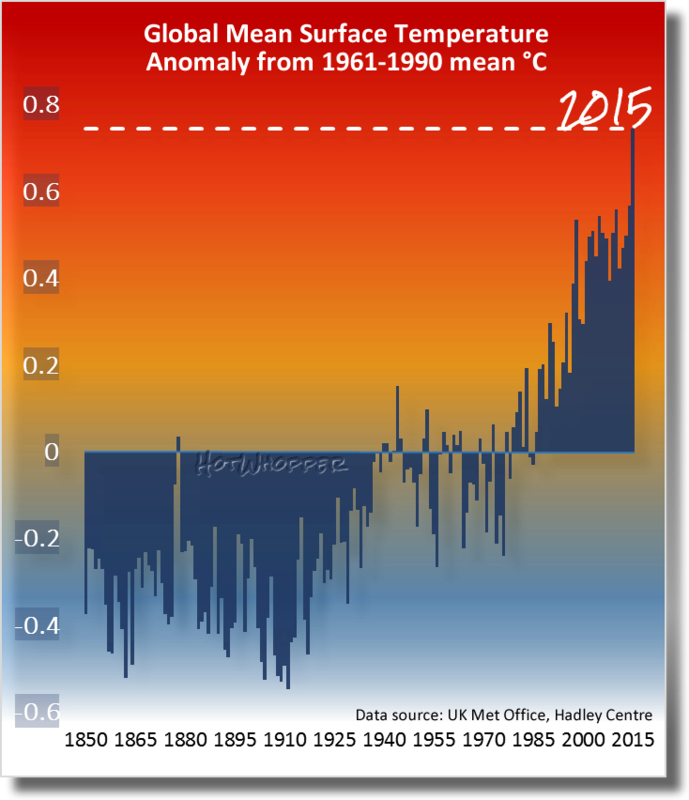 Each of the past four months, from October 2015, have had an anomaly greater than 1 °C. 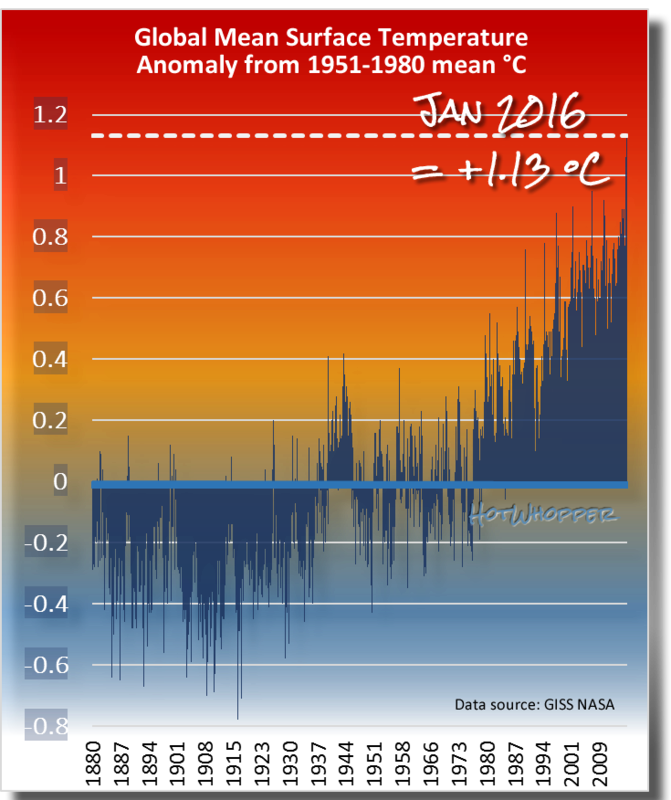 The average anomaly for the past 12 months, from February 2015 to January 2016 is 0.89 °C. In January the world was probably around 1.4 °C above the pre-industrial average global temperature - by my rough estimate. The climate models used by the Intergovernmental Panel on Climate Change (IPCC) are not simulating climate as it exists on Earth. 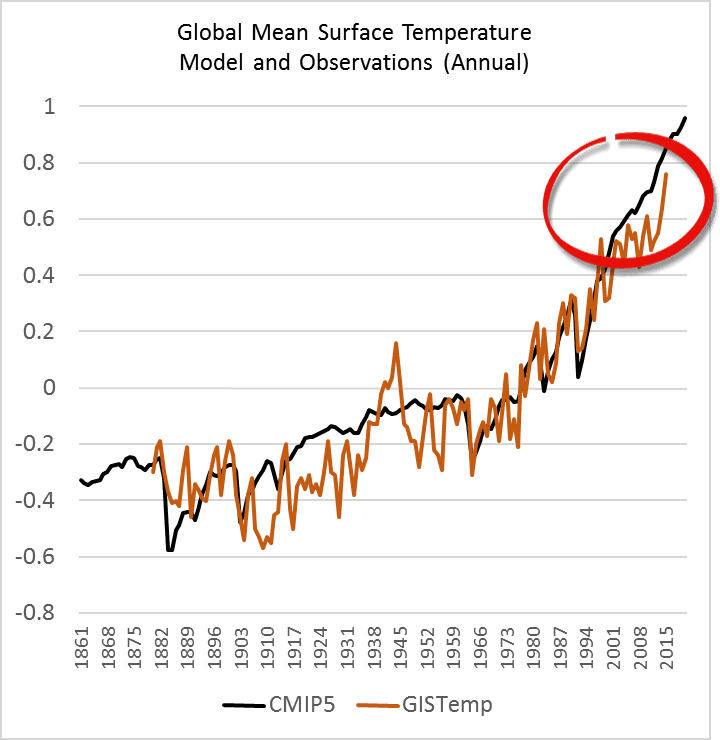 The multi-model mean of climate models used by the Intergovernmental Panel on Climate Change (IPCC) are not simulating climate as it exists on Earth. year to year variations in the weather as recorded by the older version of Reynold's OI v2 data, when looking at some sections of the ocean. There were some charts that were noticeable by their absence, so I figured I'd fill in the gaps in his article. Anything much about it at all, except that some parts of the USA would get chilly. His article was nothing more than a static image of a minimum temperature map and two tweets from Ryan Maue. So I decided to go elsewhere to check the weather out. I was going to add this in reply to a comment from Kip Hansen but since it's a pointer to just a few of the ongoing science scams and lies from his fellow crooks, it's worth an article. Kip Hansen, in a fit of denier weirdness, regards it as a badge of honour to have his nonsense ridiculed. Kip seems to think that his fellow climate science denying conspiracy theorists are the "best company in the world". Kip said I didn't understand his denial but, as is common with deniers, (and unlike yours truly) doesn't say where he thinks I was wrong. Do I need to point out that it's Kip and the immoral, heinous crowd he hangs out with who either don't understand climate science or knowingly lie about it? It's Kip Hansen who is an anti-future activist who rejects 97% plus of two centuries of science. Figure 1 | Global mean surface temperature change of the past 165 years. Data source: UK Met Office. Peter U. Clark, Jeremy D. Shakun, Shaun A. Marcott, Alan C. Mix, Michael Eby, Scott Kulp, Anders Levermann, Glenn A. Milne, Patrik L. Pfister, Benjamin D. Santer, Daniel P. Schrag, Susan Solomon, Thomas F. Stocker, Benjamin H. Strauss, Andrew J. Weaver, Ricarda Winkelmann, David Archer, Edouard Bard, Aaron Goldner, Kurt Lambeck, Raymond T. Pierrehumbert, Gian-Kasper Plattner. Climate conspiracy theorist Anthony Watts is widely regarded for his ongoing services to climate disinformers. He's also well known for not knowing anything about climate. He can't read a temperature chart, not even for the USA, he fails at arithmetic and logic, and is willing to promote any notion, no matter how ridiculous, as long as it fits his view that climate science is a hoax dreamt up by scientists cemturies ago. Today he's decided to give up on satellite data, and give up on his precious surface stations, and throw his lot in with uber-conspiracy nutter Tim Ball. (Yes, that Tim Ball. Defamer, "sky dragon slayer", and fan of Hitler and Osama bin Laden.) Anthony posted an article with the headline: Long -Term Climate Change: What Is A Reasonable Sample Size? ... Except that wasn't the question. Having written about one failed prediction, I was prompted to investigate another. This time it's from Nicola Scafetta from 2012. He wrote an article at WUWT (archived here), which was based on a paper he had published in the Journal of Atmospheric and Solar-Terrestrial Physics. As with Girma Orssenga, Nicola's model has failed. It's failed even more spectacularly than Girma's did. I was trawling the internet and came across another failed prediction from WUWT. This one was from Girma Orssengo, PhD, and he made his prediction in 2011 (archived here). Even though his prediction was only four years ago, and even though it was projecting ahead to 2030, I think it's fair to say that it's not looking too hot. I should say, it is looking too hot for Girma Orssengo, PhD. I predict his prediction will fail. Any takers in a bet? As is common with articles at WUWT, the article is quite a mess and the diagrams aren't pretty. 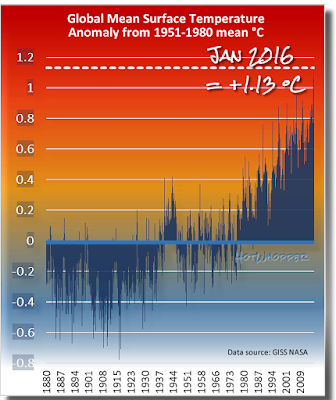 What Girma was postulating was that the global surface temperature acts like a pendulum. He even posted a picture, in case any WUWT readers didn't know what a pendulum is. In this article, following Feynman’s advice, an alternative interpretation of the same GMT data is provided that throws doubt on the accelerated warming interpretation of the IPCC. This alternative interpretation was also used to estimate the GMT trend for the next two decades, which shows global cooling from the GMT peak value of about 0.45 deg C for the 2000s to 0.13 deg C by the 2030s. Christopher Monckton has written an article (archived here) signalling that his wavering pause is probably about to come to a dead stop. There's about to be a halt in the pause. The cold air above us has been getting hotter than ever recorded these past few months. 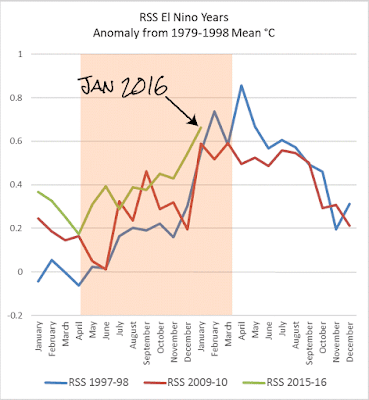 For both RSS and UAH, November was the hottest ever November, December the hottest ever December and January the hottest ever January ever reported in the satellite record. That's looking back 35 years, since 1979. Schmidt and Karl, like the Met Office this side of the pond, say there has been rapid surface warming over the past 19 years. If so, where on Earth did it come from? Christopher Monckton just made that up. That's because he wants you to think that global warming stopped when it didn't. 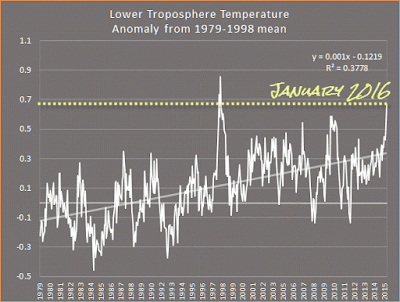 Scientists haven't been talking about "rapid" warming of the past 19 years. They've been warning of rapid warming since industrialisation. They've been warning us about the particularly rapid warming since the early 1970s. What they have said is that warming slowed for a short spell in the early part of this century at the surface (but not in the oceans), but that the longer term trend hasn't changed. It could even be speeding up again. We'll have to wait a few years to see. However the medium term trend hasn't changed so far, and it's high, at around 0.17 C/decade. 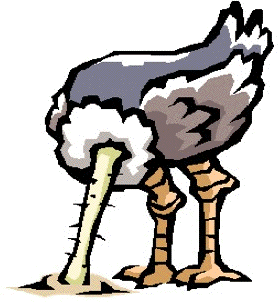 If the article at the Sydney Morning Herald is true, then the CSIRO and Australian government have decided to dim the lights on climate science. Instead of researching climate science and climate change, the CSIRO management has decided to research how we can adapt to it. It should not be a case of either/or. We need both. Now applied research and development is the stock in trade of the CSIRO. That R&D organisation was established primarily for the "D" in R&D. It exists for the economic benefit of Australia. As with a lot of universities these days, it is expected to earn money through patents, licences, contracts and partnerships with industry and business. I've no problem with that. CSIRO has some very worthy successes. The problem I see is that in order for development there has to be research. Research precedes development in the R&D chain. If we don't properly understand what is happening and what is going to happen, then we won't properly understand what it is that we need to adapt to. So the question becomes - how are we going to adapt if we don't understand well enough what the future holds? After attacking scientists who push for open data, Judith Curry now wants to muzzle climate scientists. She promoted another article from a science-denying WUWT-er, who wants to restart climate science research (archived here). He doesn't say why, but I expect that he's tired of hearing about the "hottest year on record" and the rest, and thinks that if he doesn't know what's happening it can't hurt him. No-one will be surprised to learn that Judith Curry supports vicious attacks on scientists who publish on controversial topics (archived here). She gave up science for blogging her science denial a few years ago. Now she's turned her attack onto two people who have been strong advocates for open science, Professor Stephan Lewandowsky and Professor Dorothy Bishop. Regardless of the headline, the body of the press release is clear, and the study is quite interesting. The paper was by Patrick T. Brown, Wenhong Li, Jonathan H. Jiang, and Hui Su. (The authors thanked Drew Shindell in among other acknowledgements.) What the scientists did was look at the obvious and explore it in detail. It's a bit closer to the lower troposphere temperatures in previous El Niños, which is less of a rise than I expected. The January global value is 0.54 C above the 1981-2010 baseline average. In 1998 and 2010, January was 0.49 C above the baseline average, so only 0.05 C difference. This is much less than the difference in previous recent months. Not that you can tell a lot by a single month. Not content with denying climate change, now WUWT is denying the weather. I noticed this claim about storm Jonas at WUWT today, which the meteorologist (ret'd) missed. Tim Ball is claiming that Jonas forecasts failed (archived here). In his article he weaves a conspiracy theory of mammoth proportions, ticking the boxes of six of the seven criteria for conspiracy ideation. This includes twisting the facts to fit his conspiracy theory. It also requires Tim to refer to a 12 month old article about last year's blizzard as proof that the this year's blizzard didn't happen - or something. Wrong storm, wrong year - Tim got his blizzards mixed up. Before beginning on Tim's wildly imaginative conspiracy theorising, here's a short recap of storm Jonas. Storm Jonas was the fourth most severe storm in the region in at least the past 66 years. Early warnings began more than a week before the storm was forecast to hit, giving people plenty of time to prepare. All the weather models were in general agreement, unusually for a storm like this. The forecasts were remarkably accurate. The dump of snow on New York city was a bigger than expected but otherwise the weather forecasts were pretty well spot on. The storm killed 55 people, caused a storm surge as big or maybe bigger than Hurricane Sandy, dumped record snow in some built up areas, shut down activity in some of the busiest parts of the USA, and resulted in more than $2 billion damage. I've added more detail below, as well as in the references at the bottom of this article.